Villa Emilio Sol is a 3 bedroom villa with picturesque countryside views over the hillside towards the sea plus quality, traditional interiors. It's only a few minutes' drive from the centre of the white village of Frigiliana, along with a small selection of shops and good restaurants. What's more the seaside town of Nerja is 10 minutes' drive away with good beaches, plus plenty of shops and places to eat. Air conditioning/heating in the bedrooms and WiFi are included. The homely nature of the villa coupled with picturesque countryside views. Both Frigiliana and Nerja are within easy reach too. The private pool surrounded by sun loungers where you can sit back with a cool drink and enjoy the wonderful views of the Frigiliana countryside towards the sea in the distance. There's a table and chairs on the covered terrace, so along with the Brick BBQ you'll have all you need for dining alfresco. The gates open onto a parking area with some steps up to the covered terrace where the front door opens into the living area. There is an open plan lounge, dining area and fully equipped kitchen with a homely and traditional feel. It has comfortable seating, a feature fireplace, plus a dining table and chairs for entertaining your party. From the kitchen, there's a door to access the pool and BBQ area. There are 2 twin bedrooms and 1 double bedrooms, which share a separate shower room and a separate bathroom. All bedrooms have fitted wardrobes and make a comfortable, welcoming space after a day exploring or lazing by the pool. 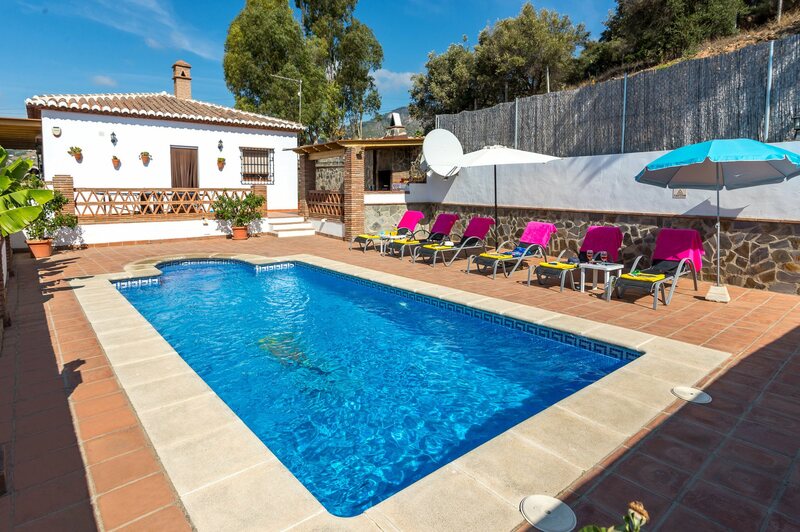 This villa is registered and licenced by the Junta de Andalucia to comply with local legislation on holiday rentals. This number is: CR/MA/01143. Set on the hillside above its own avocado groves, Villa Emilio Sol is a short drive from the award winning white village of Frigiliana with its hanging baskets and cobbled streets. Enjoy a stroll around its historic streets, or take 10 minutes' drive to Nerja to explore its shops, restaurants and cafes or relax on any one of its seven beaches. Attractions including the famous Nerja Caves and Aquavelis Water Park in Torre del Mar are also within easy reach. There is a small selection of shops 1 mile away in the village of Frigiliana. Or, the resort of Nerja is just a short drive away and offers wonderful boutique shops with many opportunities to buy leather goods and jewellery, as well as clothing. The streets in the centre are lined with small shops dotted in-between the bars and restaurants. Market day in Nerja is Tuesday where you can buy almost anything. There is a small selection of restaurants in Frigiliana, whilst Nerja town provides the visitor with a vast selection of cafes and restaurants to sample. There is also plenty of nightlife available, mostly concentrated in the Plaza Tutti Frutti and the Calle Antonio Millon areas where you can dance the evening away. The nearest beaches are in Nerja, and one of the most popular is the Burriana with a range of water sports and activities going on. Along the Burriana Promenade you can enjoy a long stroll with plenty of activity along the way. More central to the town, there is the Carabeo stretch of beaches, consisting of several coves, some of which are accessed by long flights of steps. A great day out would be a visit to the famous Nerja Caves which are on the outskirts of Nerja, and the exciting water park, Aquavelis, located in the nearby town of Torre del Mar. The nearest Golf Course is Baviera Golf, near Caleta de Velez. This is roughly half way between Nerja and Malaga. Between the resorts of Nerja and Frigiliana there are many walks to enjoy and local guides can be obtained. Walking along the River Chillar in summer is great fun with a cooling splash in the water and plenty of wildlife to see. Villa Emilio Sol is not available to book for season as it is sold out. Take a look here at the Andalucia villas that are currently on sale. If you see nothing else during your villa holiday at Nerja, don’t miss the spectacular Balcón de Europa for the best view in the Costa del Sol! From this circular viewpoint at the end of a palm-lined promenade, you gaze out at a vast panorama of town, coast and mountains. The old town is still lovely, with the maze of narrow streets and traditional architecture virtually unchanged for centuries. At the centre is Plaza Tutti Frutti where bright young things dance to live rock, pop and traditional Spanish music till the early hours. The next day they will be sunning themselves on Burriana Beach, or browsing the shops of Calle Pintada and Calle Cristo until sundown, when they do it all again!